Just this past week, I had the pleasure of camping out all weekend with my wife and a few good friends at a State Park located in Indiana. As it comes to no surprise to most people that know me, I’m a fairly experienced outdoorsman who has spent a lot of time alone out in the woods and on the water. I don’t normally go camping simply to camp, but every so often I find myself hunting or fishing in a fairly remote location and sleeping in a tent is the only option. For the crew that I spent the weekend with, camping was simply a get-a-way from city life. It was a very enjoyable time but I did learn that there are very stark differences between outdoorsmen and non-outdoorsmen when it comes to spending time out in nature, especially camping. In no particular order, these are the top three things I noticed. #1. People who are not familiar with spending time in the outdoors pack way too much stuff. Now, don’t get me wrong, having what you need when you need it is paramount in being successful on a hunt, a fishing trip, or any adventure, but it can be awfully easy to go overboard. I packed my camo backpack with two changes of clothes, extra socks, a knife, matches, and a head lamp. I packed my Jeep with my sleeping bag and tent. I gave a long look at what I packed and called it a job well done. My wife did the same but also packed twice as much, just in case. Our friends, who we met at the campsite, brought so much stuff that they filled the whole trunk of their SUV and backseat. Most of it went untouched, but by God, it was there if they needed it. I even think I saw a camo Snuggie. #2. Outdoorsmen take nature for granted. I have spent my life outdoors. I have seen more birds, chipmunks, squirrels, raccoons, deer, turkeys, and any other North America animals that I can shake a stick at. People who spend their lives in a city do not. My whole weekend was spent watching my wife and friends be fascinated by nature. It was pretty amazing. Even something as simple as a woodpecker was a spectacle that captured everyone’s attention. Over the years I have seen these same things so much I see them simply as an indicator of animal movement or a nuisance that is screwing up my hearing. It reminded me to take a step back next time I am alone in nature to get back to enjoying the whole picture instead of being so focused on solely catching a fish or hunting an animal. By judging my wife’s reactions to seeing a bald eagle, the double rainbow guy might have just been misunderstood. More people have something in common with him than they would like to admit when it comes to nature. You see, she was right there with him, only saying, “It’s abaaaaaaaaaaby!”, instead of rainbow. #3. Speaking of animals, State Parks tend to be full of them. Non-outdoorsmen see most animals as cute and innocent at a distance, but when they come near, they become terrifying, life threatening creatures. I have been around enough raccoons in the wild to know their characteristics and mannerisms. The same holds true for most animals an average hiker or canoe’er might encounter on a weekend get-a-way. However, non-outdoorsman have no idea. Like, literally none. I had to laugh at the stories of the supernatural abilities that I heard from my camping party that deer, squirrels, and raccoons can apparently perform. 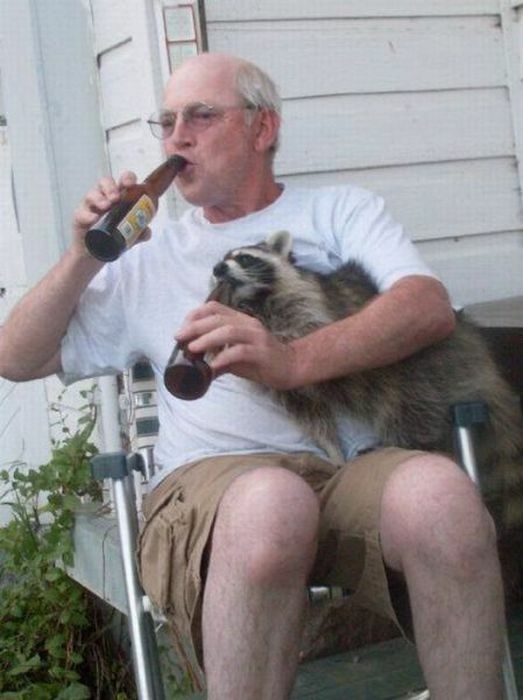 For example, it has been said that raccoons can open coolers and pop the tops of beer cans. Maybe they can. I’ve never seen it happen though. Just saying. On that note, not only are animals scary, but the dark is even worse. Again, as an outdoorsman, I have spent a lot of time alone in the woods in the dark. Long walks to my tree stand before the sun is even on the horizon followed by long walks back to the truck after the sun goes down is pretty common. It can be a little unnerving at times when coyotes sound off mid hike, but I normally find it peaceful to be so secluded in the dark when the night sounds come out. However for people that aren’t used to being in that environment, its the stuff nightmares are made of. At one point we were all sitting around the fire long after the sun went down. Every person of our group had a flashlight, except me. The second a noise would emit from the surrounding woods near us, every flashlight would immediately turn on and shine towards the direction of the noise accompanied by whimpers and the occasional shriek. No matter how many times I suggested to allow their eyes to adjust to the night, another light would turn on blinding everybody. I think planes passing over us probably thought we were hosting a rave party. However, I will admit the first time I was alone in the woods, I thought aliens and axe murderers were after me also. I still do from time to time. So what do you think? These are the main difference I saw. The bottom line of the whole weekend was that we were all thankful that places like these state parks exist for all of us to enjoy regardless of our background. For one weekend, a small group of people from the city, and one from the country, all shared a common experience that so many outdoorsmen hold close to their hearts. Hopefully it wasn’t the last time and we can make this more of a habit than a once a summer escape to a park, but who knows. Those raccoons were scary.